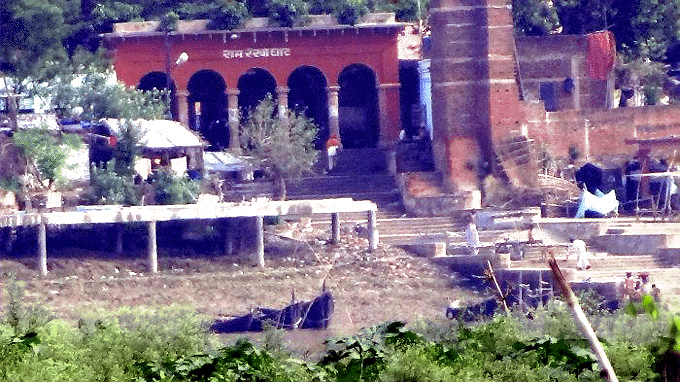 An ancient Vaisnava site in Bihar. "On leaving Patan-Bihar, I visited Dondia Khera and Baksar Ghat, both on the Ganges. Dondia Khera is a dilapidated fort of the Bais Rajputs, perched on a bold projecting point of the river bank. The mound is about 50 feet high at its highest point. There are seven temples, but they are comparatively modem. There are also several brick buildings, but all in a dilapidated state, although none of them appear to be old. The bricks are all small, the sculptures are all modern, and there is nothing now to be seen, save the lofty mound, that would suggest an antiquity of more than a few centuries. At Baksar Ghat is the ferry over the Ganges between Dondia Khera and Gunir. Baksar itself is a very holy place which received its name from a demon named Bakasa or Yakasa, who was killed by Krishna. He is also said to have founded the temple of Nageswar-Nath [Vakesvara] in honour of Siva. Several fairs are held at Baksar during the year; but there are two that are more important than the rest, as they are attended by many thousands of people for the sake of bathing in the Ganges at the two auspicious moments of the full and new moon. The former is held on the Purnamasi, or full moon, of Kartik, and the latter on the Amavasya, or new moon, of Magh. I was a witness of the latter celebration, when many thousands of people assembled to bathe in the holy waters of the Ganges at the fortunate moment of conjunction of the sun and moon (amavasya). All day long on the 1st February 1878, women and children from all parts of Oudh were passing my tent at Dondia Khera on their way to Baksar Ghat, to be ready to bathe early the next morning. The men remained behind to work during the day, but started early in the evening to journey all night towards the holy ghat. On the morning of the 2nd I passed many thousands of men, women, and children on my way to Baksar. The women had already begun to bathe at 7 o'clock in the morning; and as I crossed over the Ganges in a boat, the view of the village, perched on a lofty mound, with the whole of the sloping bank covered with thousands of people down to the water's edge, was very picturesque. On landing I met hundreds of people hastening from Gunir and other places in the Doab to cross over to the bathing place." The bathing ghat referred to by Cunningham remains a famous pilgrimage destination on the Ganges. Not only is Baksar tirtha named after Sri Krsna's glorious liberation of the Baka demon, it also has a direct place in Ramayana history. 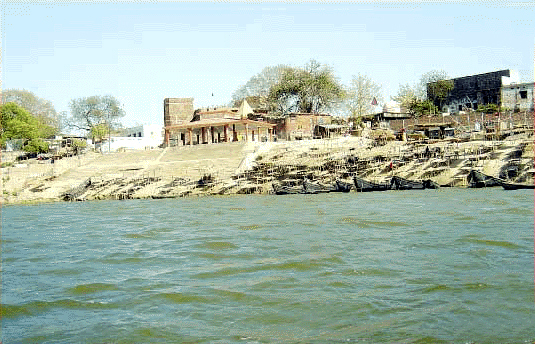 At this sacred ghat, Lord Rama came to take bath after killing Tadaka. Ancient Baksar (Buxar) is also mentioned in Vaisnava literature by the names Siddhashram, Vedgarbhapuri, Karush, Tapovan, Chaitrath, and Vyaghra Sar. The name is thought to be derived from the Sanskrit vyaghra and sar (tiger and pond). Some relate this to the tiger-like face of Rishi Vedshira, the outcome of a curse placed upon him by the sage Durvasha. His tiger-like countenance was restored after Vedshira bathed in a holy tank, which became known as Vyaghrasar. The Baksar ghat, situated about 118 km. east of Patna, the capital city of Bihar, is referred to in Valmiki's Ramayana as Ram Rekha Ghat. Sri Rama is said to have visited here twice. The second occasion was after His coronation, when Rama came and performed yagna, drawing the outlines of the yagna platform with the tip of His arrow. There is an imprint of Rama's lotus foot here. 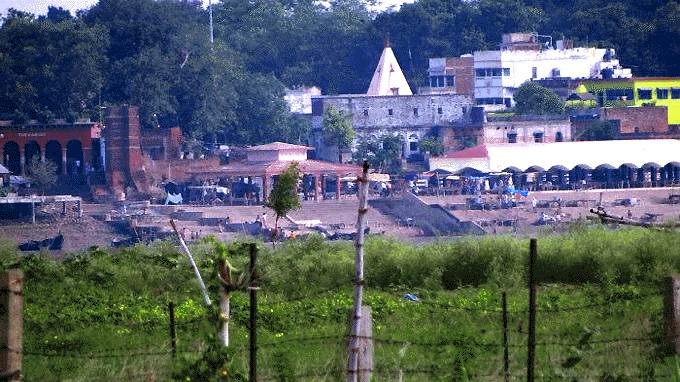 Very close to the Ram Rekha ghat is the Vamana Ashram, located within the precinct of the local prison, as well as a small temple in which many sannidhis are found. In the first shrine on the left is Sri Vishwakarma. Next are the shrines of Rama, Lakshman and Sita, then a murti of Vishwamitra. A little further on, a flight of stairs leads down to an ancient catur-mukha deity of Lord Brahma. About four miles west of Baksar Ghat lies Dondia (Daundia) Khera, the village visited by Cunningham. The forested area sits atop a sharp point on the Ganga's bank. The old fort includes two buildings, known as the Raja's and the Rani's palaces. Cunningham noted this spot as being the capital of the kingdom of O-ye-mu-khi (Hayamukha) visited by Hiuen Tsiang. However, given that there are no remains of any buildings which can be identified with the monuments described by Hiuen Tsiang, and no other historical evidence in support of it, he changed his opinion in 1878,instead identifying Tusaran Bihar in Pratapgarh district and Singraur in Allahabad district with the ancient Buddhist settlement he once thought to have been at Dondia Khera. Tadka Vadh - Buxar, Bihar: After crossing the holy Ganga, Shri Ram and Lakshman reached a dense forest where demoness Tadka lived. The dreadful forest was known as Tadkavan. Shri Ram ended Tadka's reign over the forest by slaying her and freeing its inhabitants from terror. The forest stretched between Bharoli and Baksar in Bihar. Shri Ram performed the first task of his "avtaar" (incarnation) here by destroying the evil demoness. 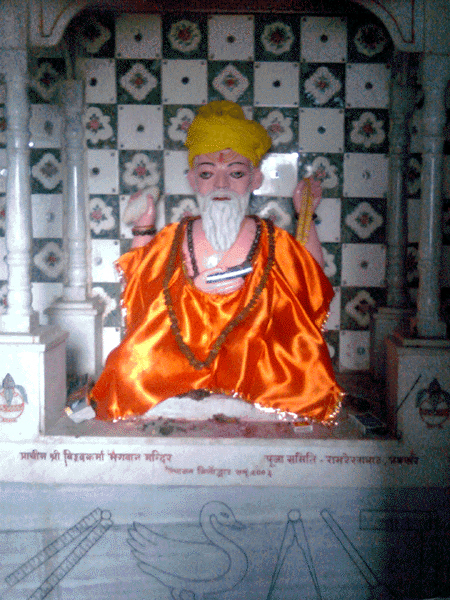 Siddhashram: Buxar, Bihar: Rishi Vishwamitra's Siddhashram was located not too far from Baksar. Siddhashram, according to Adhytma Ramayan was a social ashram where religious instruction was imparted to people. Shri Ram and Lakshman sojourned in the ashram for three days after Shri Ram killed Mareech and Subahu, the demons who were tormenting Rishi Vishwamitra by dirtying his Yagna (fire sacrifice) with bones and blood. Lakshman destroyed an entire demon force brought by Subahu while Shri Ram took on the mightY Mareech, son of Tadka, the demoness he had done away with earlier. There are villages existing today on the banks of the River Ganga with the names Mareech and Subahu. Ahilya Uddhar - Ahroli, Buxar, Bihar: Three kilometers from Buxar in the northern direction is the village Ahroli. Rishi Gautam had his ashram here. According to Ram Charita Manas it was here that Shri Ram delivered Ahilya, the beautiful wife of Rishi Gautam, from a curse of her husband, which had turned her into stone. When Shri Ram and Lakshman left Siddhashram they crossed River Ganga and River Sonbhadra and set foot on the soil of Ahroli village, which still exists in Buxar district. Every year, on the 18th day of Pausha month (Dec/Jan), a large number of people throng to Ram Rekha Ghat for Makar Sankranti fair. Popularly known as Khichari mela, the fair draws thousands of people who come to the ghat to take bath in the Ganges.